Here’s a robust, knock your socks off, kind of beer. 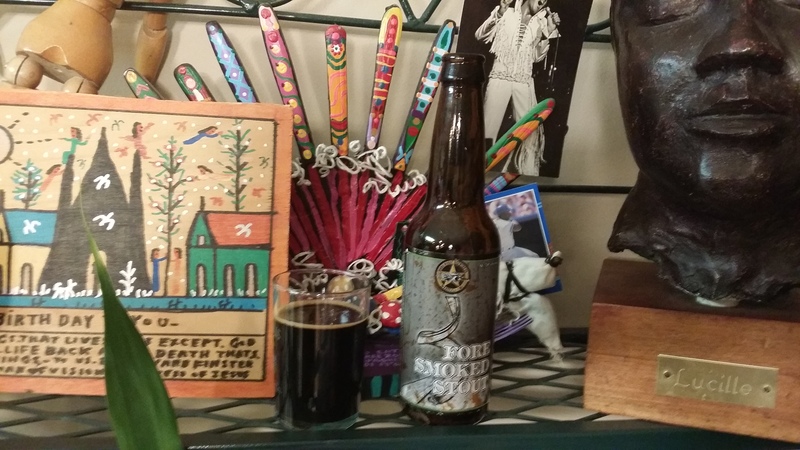 Fore Smoked Stout wow’d the 3 newly ordained ministers just by watching it pour. It pours like syrup, coating the inside of the glass with a sweet smelling, used motor oil colored libation. So dark that my scientifically designed beer light failed to pass the 1/2 centimeter mark (a true 7 out of 7 Smokestacks in Opacity rating). Tastes that come through include dark chocolate, peanuts, syrup, malt, and peat. A meal in itself with a strong after taste. Incredible. Final score = 5.7 Smokestacks. Brewer Dark Horse Brewing Co.
Brewer’s Description Number Four – Brewed with all malted barley and peat malt (smoked malt). This beer is full bodied with chocolate, roasted barley flavors, and a smokey almost BBQ finish. Image | This entry was posted in Beer, Educate, Enlighten, rauchbier, Smokebeer and tagged 5 - 6, Dark Horse, Michigan, peat, Stout. Bookmark the permalink.